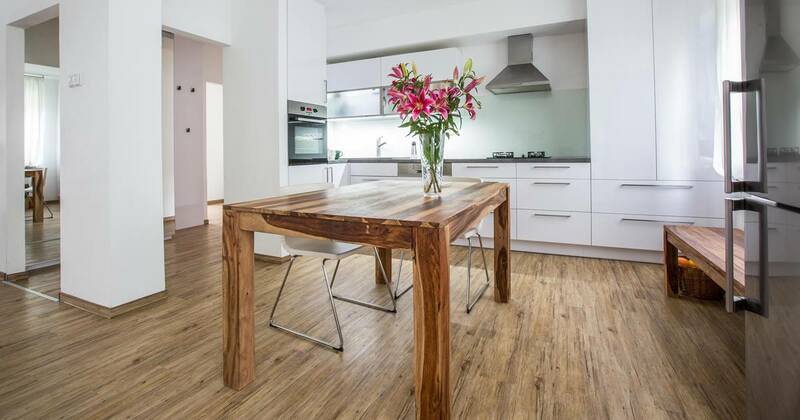 When choosing a kitchen floor, there are many factors that should be taken into account. To help you pick the right one for your own kitchen, we’ve asked a contractor offering professional tile installation in Downriver, Michigan to tell us more about the most common kitchen flooring types. Read on to find out which one is ideal for your home, your budget and your own preferences. Hardwood Flooring – This flooring type is perfect for people who wouldn’t like their kitchen to look dated as time goes by. It’s durable and ideal for open floor plan. Visual appeal and warmth of hardwood flooring is unparalleled; it creates a look that won’t go out of style. This is a wonderful choice if you want to sell your property someday. For open floor plans, hardwood floor is perfect because it works lovely in both living areas and kitchens, thus it can create unified and warm look. Although it’s highly durable, hardwood is low-maintenance, too. If you choose hardwood flooring for your kitchen, keep in mind that it can be made in two ways: engineered planks or solid strips. Changes in temperature and humidity, which are very common in kitchen, can cause movement of flooring and the engineered wood planks are less susceptible to that, thus they are better option for kitchens. Vinyl Flooring – This flooring type is ideal for those who cook a lot and are looking for the floor that’s incredibly easy to maintain. In addition, vinyl flooring is the most affordable option. Resilient flooring such as sheet vinyl is the softest flooring type (especially cushioned vinyl flooring) and, if you like to (or must) cook a lot, its softness can ease muscle fatigue while making it easier on your feet. If you tend to drop things, there will be less breakage with this flooring type. In addition, it’s very easy to clean up and stain- and water-proof; beyond mopping and sweeping it requires no further maintenance. High quality vinyl can last up to 25 years. On the downside, depending on the layout and size of the kitchen, there might be seams. They are completely unwanted because they can trap dirt and let moisture in the sub-floor. Also, when it’s wet, vinyl can be very slippery. Porcelain Tile – This flooring type is ideal if you’re looking for the low maintenance, tough flooring or you want the look of stone. It’s a version of ceramic tile, the most durable and toughest flooring type. Since they are fired at ultra-high temperatures, these tiles are hard and stain- and water-resistant. Not only this flooring option is perfect for a kitchen, but they are also good for outdoors in almost any climate. You can choose between glazed and non-glazed porcelain tiles; the latter have earthy, natural tones while a glazed tile comes in any color and pattern you like. It’s crucial to choose a slip-resistant porcelain tile for your kitchen flooring. Cork Flooring – This is an ideal flooring type for people looking for more eco-friendly options or those who want something softer than tile or wood, yet very slip-resistant. Tree barks are harvested approximately every 10 years and it’s what cork is made from. Thus, it represents a sustainable, eco-friendly material. In addition, because of its unique cellular structure, cork is compressible and waterproof, which is crucial for kitchen flooring. With its naturally textured surface, cork tiles are slip resistant. Nevertheless, cork floors require to be resealed every 3-4 years in order to prevent scratches or moisture and dirt to enter the seams between the tiles. As a sealer, you can use water-based eco-friendly polyurethane or natural wax.